Bellwether Award winner Susan Nussbaum’s powerful novel invites us into the lives of a group of typical teenagers—alienated, funny, yearning for autonomy—except that they live in an institution for juveniles with disabilities. This unfamiliar, isolated landscape is much the same as the world outside: friendships are forged, trust is built, love affairs are kindled, and rules are broken. But those who call it home have little or no control over their fate. 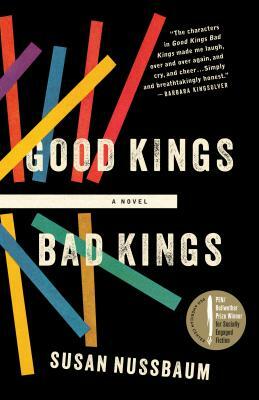 Good Kings Bad Kings challenges our definitions of what it means to be disabled in a story told with remarkable authenticity and in voices that resound with humor and spirit. Susan Nussbaum’s plays have been widely produced. Her play Mishuganismo is included in the anthology Staring Back: The Disability Experience from the Inside Out. In 2008 she was cited by the Utne Reader as one of “50 Visionaries Who Are Changing Your World” for her work with girls with disabilities. This is her first novel.